When families come to Littleton and Rue, they are comforted by the people and by the peaceful setting...a home surrounded by four acres of beauty in the middle of the city. Watch this video to learn more. As the years steadily tick toward the century and half mark, the stately, majestic mansion perseveres. Well kept and refined it cannot tell its true age. The tax appraiser's statement, an old house must suffice. Even though the mansion now sits in one of the busiest sections of town, it remains a peaceful place among the hustle and bustle of the 2,000's. The estate is situated on three and three-fourths acres surrounded with oak, maple and evergreen trees. Many visitors that pass through the main gates often wonder about the people who once lived here. The contributions that these people and their families made to the growth of Springfield will always be remembered. The history begins in the 1830's and 1840's when the mansion was but then only an isolated farmhouse sitting near the northern edge of a 63 acre farm situated just a short distance north of the center of Springfield, Ohio. At this time the area was a wilderness. Large spreading elm trees helped the maple, ash and evergreen trees shade an area where agriculture was of little importance. Over the years this estate has been through many changes and has had many generations pass through its doors, but the impact that each of these people had to the growth of the city is beyond measure. As the years rolled by, the individual homes of family members stretched along North Limestone Street from North Street to Chestnut Avenue. In 1909 the farmhouse at 830 North Limestone Street was purchased. Four acres of the original land was reserved for the family's use. In 1913 the original old farmhouse was torn down and rebuilt into one of the most beautiful and most tasteful mansions in the city of Springfield. Our story begins when Dr. Robert Rodgers came to Springfield in 1833. He was born September 17, 1807 in Cumberland County, Pennsylvania. The young physician lived with his wife, Effie Harrison Rodgers, and their seven children in a large two story brick house that stood on the north east corner of North Limestone Street and North Street. This site is now occupied by the Springfield News/Sun Newspaper plant. A few doors up North Street in a house that early Clark County Historians describe as "handsome" lived his brother and sister-in-law, William and Sarah Harrison Rodgers. These two brothers worked very closely together. When William first came to Clark county in 1832, he was a merchant. When ill health caused his retirement from that field, he bought a tract of "wild" land north of the city. He supervised the clearing and the partial improvements to the land. Then in 1851 he was a constituent member of the company who organized the Springfield Bank. Located on the west side of North Limestone Street close to Main Street, it later became The First National Bank. William would serve on the Board of Directors for many years. While no children were mentioned for William and Sarah, Dr. Rodger's two sons would become very active in the banking industry. Three doors south of the bank Dr. Rodgers had his office. Here was organized the Clark County Medical Society on May 31, 1850 with Dr. Rodgers serving as the President. At one meeting of the Medical Society, Dr. Rodgers, being a skilled surgeon, read a paper describing a new operation he had performed, the first Caesarian Section done in Clark County. A few years after his arrival in Springfield, he began buying land in the northern section of Springfield. In 1848 he laid out the first of five additions. In 1909 a Richard Rodgers laid out the sixth. These additions include the area north from Chestnut Street to the alley between Cassilly and Cecil streets and from North Limestone Street to Rodgers Drive. On an early city map, they list Limestone Street as the "Urbana Pike." Also listed for this area were streets by the name of Gallagher, Hill, Center and Race. Dr. Rodgers and Effie were the parents of three daughters and three sons. John Rodgers followed in his fathers footsteps and became a doctor. James was a banker at the First National Bank. The Rodgers also had twins, Isaac and Richard, born September 23, 1836. The twins were both officers in companies that manufactured products for the home, the farm, and for industry. Isaac was the treasurer of The Corrugated Steel Nail Company and served as president of the Patrick Furnace Company which manufactured Warm Air Furnaces. Both factories were located first at 515 West Liberty Street and then moved to 17 West Washington Street. Richard was the Vice President and a Board Member of The First National Bank. He also served as the President of the Corrugated Steel Nail Company, The Springfield Gas Engine Company, which was located on the corner of West Columbia Street and Dakota Avenue, and the Mast, Foos and Company which manufactured the Buckeye Lawn Mowers, Force Pumps, Wind Engines and Iron Fencing. It was located on the corner of West Columbia and Isabella streets. We value our traditions... which is why we've renovated this two-story playhouse built in the early 1900's, complete with miniature furniture and decor. Richard and his wife Alice Kilgore Rodgers lived at the corner of North Limestone Street and Chestnut Avenue until her death in 1884. Then Richard moved back to his old home at 206 North Limestone Street where he passed away on June 24, 1909. It is interesting to note that at that time the daily Springfield newspaper cost only one penny a copy. We value old traditions...which is why we've renovated this two-story playhouse built in the early 1900's, complete with miniature furniture and decor. 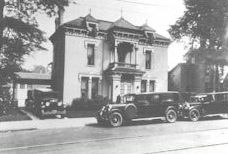 Richard's son, Robert S., and his wife, Edith Winwood Rodgers, first lived at 730 North Limestone Street. Then in 1908 they moved into the farmhouse, the forerunner of the mansion. At one time Mr. Rodgers owned part of a company known as Thomas, Ludlow and Rodgers. On November 1, 1893 it merged into the firm known as the Superior Dill Company. Then on March 15, 1903 it became the American Seeding Company with Robert Rodgers serving as the Superintendent. The company was located on Warder Street near Spring Street. It manufactured Superior, Hoosier, Farmer's Favorite, Empire and Kentucky grain drills, seeders, sowers, cane mills and saw mills. The American seeding company also manufactured the Even Corn and potato planters, dies and spike tooth harrows. Robert Rodgers was also associated with the Mast, Foos and Company which in later years added to their line of products the Imperial Wind Mills and Dairy Barn Equipment. Robert Rodgers is the one who had the iron fence installed around the estate. In 1905, at the age of fourteen, William J. Bauer began working for the company that was responsible for the installation. He earned six cents per hour and worked ten hours a day Monday through Friday and nine hours on Saturday. He was always very proud to have been a part of the project. Today this fence borders part of North Limestone Street and all of the Cassilly Street side of the Estate. Robert and Edith had two daughters, Alice and Lucinda. Alice was born August 4, 1904 and even though there were not many years between the two girls, there is no evidence of an actual birthdate for Lucinda at this time. 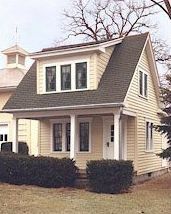 For the benefit of Alice and Lucinda, the Rodgers family built a three room, two story playhouse in the backyard and completely furnished it. While it is just big enough for an adult to move around in, it is perfect for a child. Though much of the estate has changed, the playhouse has remained virtually the same. Today it is an attraction for visitors of all ages. The estate has always been beautiful and well kept. Behind the mansion lay a formal garden complete with a closely clipped hedge border, a fountain, a gold fish pond and of course an array of flowers. Behind the playhouse once stood a greenhouse and the stables for the horses. When the city of Springfield cut Mason Street through, one eighth acre of the backyard was taken for the sake of "progress." Without a doubt the Rodgers family did many nice things for their neighbors. One story was the time after a winter snow storm that one of the Rodgers' servants hitched one of the horses to a plow and after the long walks of the estate were cleared, the pair would cross the street and clear the neighbors walks. This was not a one time thing either, it became part of the daily agenda during the winter months. On January 6th, 1924 Alice married Mr. Jonathan H. Winters, a very successful banker from Dayton, Ohio. His family owned the Winters National Bank. Mr. and Mrs. Winters named their only child, a son, after Jonathan. Even though this marriage ended in a divorce, the years together would prove vital to the future progress of the city. On September 19, 1935, Alice married Richard W. Bauman, a manufacturer. Alice was a very vivacious person and in 1941 she joined the staff of WIZE Radio Station where she later conducted a daily talk show. Alice passed away on June 18, 1970. Alice's son, Jonathan Winters, was a well known and respected comedian and television personality. Even though he spent only a short time in the mansion as a child, many of the neighbors remember that even then he had a flair for comedy. His specialty is his uncanny knack of so accurately portraying many characters of all ages and stages in life. He has publicly stated many times that he learned these tricks from his talented mother. Jonathan passed away in 2013. After Mr. Rodgers died, Mrs. Rodgers lived alone in the big house for a while. When she died, the family rented the house to Walter S. and Helen Ryan Quinlan and their four daughters. Mr. Quinlan was president of Robbins & Myers. The Quinlans resided in the mansion for a few years before Mrs. Quinlan arranged for its sale. On Christmas Eve, 1936, Herbert Littleton came to the Rodger's home in his ambulance to pick up Walter Quinlan's aunt, Mayme Snyder after she suffered a stroke. It was then that he admired and saw the potential in the property for another purpose. On Labor Day 1938, the mansion's role changed from that of a private home to a place of business. 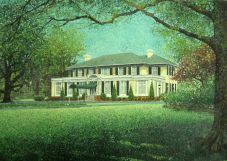 Herbert A. Littleton, a young Funeral Director, needed a larger place for his growing business and the old Rodgers Estate was most appropriate. Since 1920 he had been in business with his father, Joel B. Littleton, who had been an "Undertaker" since 1886. It is interesting to note how this business developed. At first, Joel was in business with his brother, Fisher Littleton, in Yellow Springs, Ohio. When it became clear that there was not enough work to keep both of the men busy, Joel moved to Springfield. For a while he took employment with Schindler and Snyoo Funeral Directors and Embalmers, located at 25 South Fountain Avenue. In 1908 Joel B. Littleton, Funeral Director, operated business at both 340 South Center Street and 143 East High Street. In 1913 and 1914 Joel B. Littleton, J.J. Hartman and G. Luther Dillahunt, Funeral Directors and Embalmers, operated their business at 124 East High Street. This location is directly across the street from the old Warder Public Library in the space formerly occupied by the Tot Shop. At this time, the Funeral Director took his equipment to the home of the deceased, cared for the body and then placed the body in the casket. The wake, or visitation as it is called today, as well as the funeral would take place in the home. This practice is now called "old fashioned" and is rarely seen in today's society, but it is still common in a lot of the southern states. By 1915 Joel B. Littleton operated his own business at 420 South Limestone Street. In 1920, the business name became Littleton & Son. Herbert Littleton had served as a Lieutenant in the United States Army during World War I from 1917 to 1919. In 1935 the business was listed as J. B. Littleton & Son, Funeral Directors & Embalmers. They also operated an ambulance service at 414 South Limestone Street . Joel's wife's name was Amy. Joel Littleton passed away April 3, 1937. Herbert was now left to run the family business that he had so lovingly helped his father build over the years. Herbert then married Kathryn A. Flook in 1924. After Herbert's (Herb) father had passed away, Kathryn then helped Herb run the Funeral Home. It is said that Kathryn (Katie) was the major influence in the decision to purchase the property at 830 North Limestone Street. She loved all the trees, shrubs, the acres of green grass and the peaceful atmosphere that surrounded her here. This lovely old home also helped to do away with the old stereotype of the "funeral parlor" that was so common in those days. The new location would prove to be one of a warm and friendly atmosphere. There must be something about this old place that makes the people go back to another time and another place in their childhood. Many of the visitors can remember back when they were children and played in the playhouse, sometimes referred to as the dollhouse. 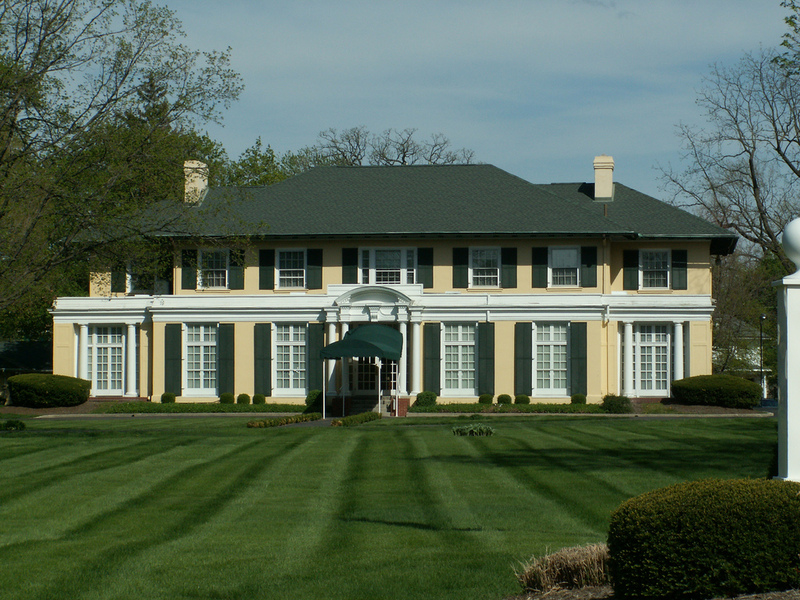 As like the original owners, the Rodgers Family, Herbert and Kathryn Littleton did as much as they could for the city of Springfield, The Wittenberg College and for their family and friends. The Littletons had no children of their own so the neighborhood children were always welcome. At one time Katie allowed some of the children to have birthday parties in the playhouse, this soon became every little girl's dream. When the Littleton's purchased the estate, a few changes had to be made. The stables soon became the garage for the hearses, flower truck and all the maint enance supplies. At this time only the floor of the greenhouse remained. This was broken up and the space and part of the backyard were used to make an additional parking area. For many years Herb and Katie resided on the second floor of the Funeral Home. In 1973, the Littleton's turned the business over to three loyal employees, Leslie A. Fisher, Thomas D. Rue, and Marion G. Burcham. They then built a beautiful ranch style home on the site where the formal garden once was. This would be as far as the Littleton's would ever live from the Funeral Home. Herbert Littleton passed away in 1974 and Kathryn on December 29, 1986. Today when death strikes, the family immediately contacts a Funeral Director knowing that he will properly care for the body, help with the selection of a suitable casket, arrange for a funeral that will best suit their needs and provide adequate visiting facilities. They are also assured that the burial will be handled properly. These services evolved from a great need to relieve the family of a tremendous burden in their time of sorrow. During the wilderness era when death occurred, usually a family member had to care for the interment of the deceased. Since little was known about how to do this, many times the burial had to be done before the funeral was even held. Because any coffins built before the death actually occurred were viewed with great distrust and fear, cabinet makers made up the coffin from sycamore wood at the time of death. Often the only way the size of the coffin could be determined was to use a corn stalk that the family provided that was cut to the length of the deceased. Funerals were usually conducted in homes that were too small to accommodate the friends and relatives that attended. After the service, the coffin was raised to the shoulders of four men. The coffin was lead out by the preacher and then following in a double line came the mourners, the men first followed by the women as the procession slowly began singing this solemn hymn and the entire group would join in singing to the grave: "Hark from the tomb a mournful sound! Mine ear attend the cry. Young men, come view the ground where you must shortly lie." As Springfield grew, the two city cemeteries, Greenmont and West Columbia Street, finally became inadequate for their needs. Dr. Rodgers was very active in organizing the Association that developed Ferncliff Cemetery. He and 33 other concerned citizens each bought $300 worth of stock to start the project. Out of this fund $7030 went to purchase 70.8 acres of land from the Henry Bechtle Estate. Ferncliff was dedicated July 4, 1864. If it were possible for the good Doctor to view a modern day funeral he would be very pleased. He would be satisfied with the present day facilities and he would be very proud to know that the beautiful mansion his grandson once owned now plays a vital and very important part in handling this sorrowful time of life. Littleton & Rue Funeral Home is now owned and operated by Tom Rue, his son Rob Rue, and longtime Springfield Funeral Director Rob Kampman.The staff of Littleton & Rue is considered to be one big "family". Once again, the great estate is occupied by a "Family" that is dedicated to doing their best not only for the city of Springfield, but for each of the families that have put their trust in them. While the mansion is now a place of business, it still remains a feeling of home.